My colleague Governor from the Pacific namely Mr Denton Rarawa from the Central Bank of Solomon Islands. Deputy Governor Mr Peter Tari from Reserve Bank of Vanuatu. On behalf of the Bank of PNG Board, my Management team and staff, I extend a very warm welcome to you all to this very special occasion – to witness and celebrate the opening of the Bank of PNG Currency Processing Facility. Thank you for making time available to celebrate with us and the people of Lae City and the rest of PNG on this occasion. My Board and Staff are humbled by your presence today and it goes to show that this occasion is of great significance not only for the Bank of PNG but for the country as a whole. Other partners from the business community such as Air Niugini, Police in Lae, various hotels, hire car companies, individuals and service providers. The idea of having Bank of PNG own currency distribution centre was first conceived by the immediate past Governor, then Mr Wilson Kamit (now Sir) in 2008/2009, to cut down on costs incurred by clients under the agency arrangement between the Central Bank and a commercial bank. This idea gained momentum in 2010 when our agency agreement with a business partner to supply and maintain quality of currency in circulation was terminated, thus posing a risk of disruption to the Bank of PNG’s mandated function of issuing and distribution of the PNG currency. The Bank assessed the risk and made a decision through its Board to build a facility of its own to store, process, distribute, collect, and destroy soiled and mutilated notes and coins. In addition, it was time to consider modern ways of securing, processing and distributing currency. will now enable the Bank to provide central banking services to the people, not only in Lae, and Morobe Province, but also the Highlands, Momase and New Guinea Island Regions. serve as the facility for changing soiled (old worn-out) notes from the commercial banks that the public deposit or exchange over the counter. Awareness including encouraging savings, women’s activities, and Money Scams and Schemes and the school visits. Disseminate information on other Central Banking Services, such licensing requirements for gold exports, banking and financial institutions, savings and loans societies, foreign currency accounts and economic information. The journey of the project was long and we are now at the end of that journey and we are opening this building to signify the Bank’s growth and maturity. The journey was filled with many challenges as it is our first building outside of Port Moresby after the ToRobert Haus which was constructed some twenty eight (28) years ago. We have learnt many lessons from this project that we will be carrying forward into our future projects. Our journey took longer than expected because being a special purpose building we had to get things right so we had to consult, seek assistance and make adjustments along the way. This is a historic occasion for us and is also in line with the Governments Medium Term Development Strategy. This strategy encourages inclusiveness of the nation’s people by bringing basic services including banking and financial services closure to our people. This is one of the Central Bank’s contributions to nation building and an expansion of our services to the wider community to bring awareness to our people on banking and finance and provide other central banking services. As the PNG economy grow and diversify, supported by big and new infrastructure in Lae/Morobe Province and other nearby provinces and the development of new resource projects like Wafi-Golpu mine, demand for currency will certainly increase. The establishment of the CPF is timely in dealing with this expected growth. One of the core functions of the Central Bank is to issue currency. This entails ensuring clean notes and coins are in circulation at all times. The issuing, distribution and circulation of quality bank notes and coins is of paramount importance to the Bank because it ensures the quality and integrity of our currencies. To ensure only good quality bank notes and coins remain in circulation, the Bank in 2006, introduced the Clean Banknote Policy. The introduction of that Policy was followed by a consistent awareness program over the past decade aimed at educating the general public on the proper ways of handling banknotes, the different security features on banknotes, how to identify different characteristics of unfit notes and how to differentiate genuine banknotes from counterfeits. This was also enhanced through the resizing of banknotes to improve differentiation of notes. As the Central Bank is a national entity, belonging to the people of Papua New Guinea, we strive to reach as much of the population as we can through some of our initiatives such as financial inclusion, and choosing Lae, Morobe Province as the location to build the CPF was a strategic one. Lae being the industrial hub of PNG connecting the Mamose, Highlands and New Guinea Islands regions is a strategic location as it is accessible by all three (3) modes of transport, i.e. land, air and sea. I am proud to say that the introduction of polymer notes which was first circulated in 1991, the demonetization of paper banknotes and implementation of various security features on our bank notes has significantly reduced counterfeiting. There has been no report of counterfeiting for polymer notes. The design features of our currencies are of national significance as well. The construction of this building not only enables us to perform this function but it also provides us with an opportunity to modernize and automate the currency processing function. In future this will enable us to accurately and effectively track currency in circulation (and money supply). The Bank is mandated under it legislation – the Central Banking Act 2000 to promote an effective and an efficient payments system to enable trade and exchange of goods and services in the economy. We have made historic progress in this arena in the last five to seven years starting with the enactment of the National Payments System Act in 2013. The National Payments System Act has enabled the implementation of a National Payments System called Kina Automated Transfer System (KATS), mobile banking and electronic banking, needless to say that the use of hard currency is still dominant in PNG. Introduction of Fintech products –move away or less use of cash. Money scams/schemes PNG being a cash economy, many people and business will continue to use cash. Cash is still King. The name of the CPF building is, Bakani Andu Kanom Sêga taken from the Yabem lingua franca, is in recognition and in respect of the fact that the city of Lae is on the land of Yabem villages. The name signifies and depicts the true nature of the Central Bank, the issuer of the legal tender (currency) of PNG. 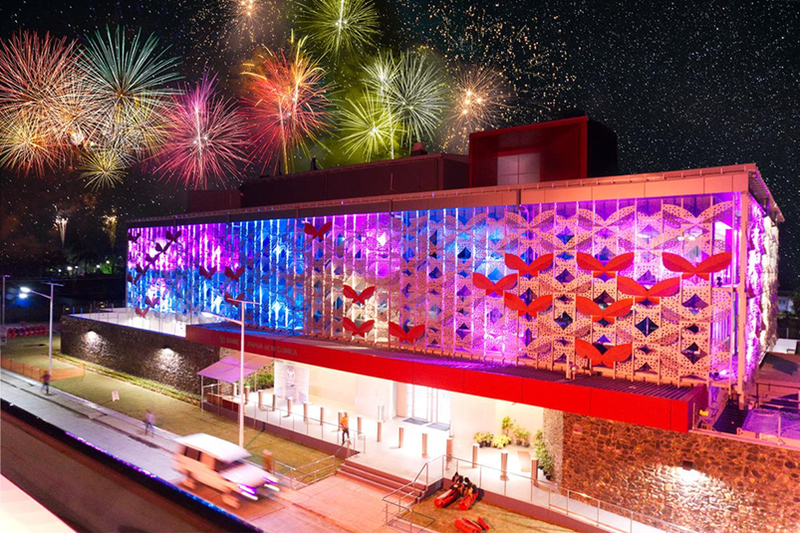 You might also be wondering why we have featured designed facades of butterflies on the building. The butterflies pay homage to the demonetised 1 Toea denomination which featured the Queen Alexandra Birdwing Butterfly on the coins tail commonly found in Oro Province. 60 – 70 employees, who will live and work in Lae. In conclusion I once again acknowledge the strong support from many people, including Members of the Bank’s Board, our management team and staff members, along with a wide range of stakeholders who have contributed to bringing this important project to completion. I look forward to being able to report to the people of Papua New Guinea how this facility has improved your central bank’s ability to conduct one of its core functions – that of distribution of our currency. Once again thanks very much for your attention and enjoy the rest of the afternoon. DANGE NGAYAM, DANGE SAKO.